CONDITIONS OF SALE: The painting has to be exhibited free of charge for at least 182 days every year. STORY: This painting targets gender inequality all around the world, with some of the most striking examples currently happening in parts of the Islamic World. 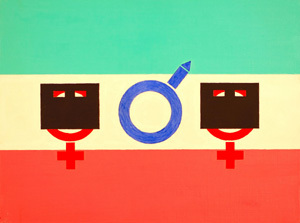 Iranian flag is here used as a symbol of woman oppression, with the central tulip being replaced with biological symbols for male and female. Female symbols are wearing burqas, the most depersonalizing form of hijab. However, the tradition of people covering or shaving their hair as a sign of modesty and fidelity is global and ancient in origin. Its remnants can be seen today on the heads of observant Jews as well as the British queen. Despite their potential cultural significance, AbFab will always argue that deliberate outside expressions of modesty and spirituality are shallow in their nature, and mostly used to cover up personal selfish aspirations. One of them is the male natural desire for polygamy (polygyny), which is also targeted on this painting. AbFab does not explore weather polygamy is good or bad, but weather it is available to both sexes. So far there are not countries where female polygamy (polyandry) has be regulated positively by the low. Observant reader will know that polygyny is in fact rare in Iran, although this country receives majority of the negative media exposure in the Western World.